Covers wide areas and is easy to install and operate. I am very happy with this product, very easy to install. Quality of camera is very good. I can easily monitor my shop area while sitting at home. Good product available at affordable price. Good camera, easy to install. Video not very high quality but good enough to monitor only. Installed it in my dining room,covers living area and kitchen easily. Purchased this product few days ago. The product is exectly what is advertised. 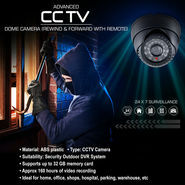 Camera is easy to install and very easy to use. Worth buy. Camera is very good. Nice clarity both day and in night vision. Also, the customer care were very supportive who helped me in giving instructions for the installation. I purchased this product and using it as a baby monitor to see when my 1 year old baby sleeping upstairs. Useful product.